Home Blog Liquid Level Measurement Using the "Bubbler Method"
Liquid Level Measurement Using the "Bubbler Method"
General chemical industry applications where liquids are stored in tanks. Achieving level measurement of a liquid in a tank using a pressure transmitter to measure the pressure created by the weight of the liquid. The key feature of this method is the use of a small diameter (typically ¼") tube installed in the tank to allow the pressure measurement to be taken at the top of the tank, eliminating potential leak points at the bottom of the tank. The pressure measured at the bottom of a tank of liquid will be proportional to the level of the liquid in the tank according to the relationship: Height of liquid = Pressure at bottom of tank / density of liquid. To avoid possible leak points, the pressure measurement can be taken at the top of a "dip tube" installed in the tank as shown in the diagram above. The key to the accurate measurement of liquid level is the introduction of a low rate of gas flow in the tube, effectively transferring the pressure at the bottom of the tank to the inlet of the tube (plus the small pressure drop created by the flow rate in the tube). To keep the pressure drop low in the tube, a flow rate of 1.0 SCFH is typical for a ¼" diameter dip tube. This minimizes the offset in the level measurement created by this pressure drop. 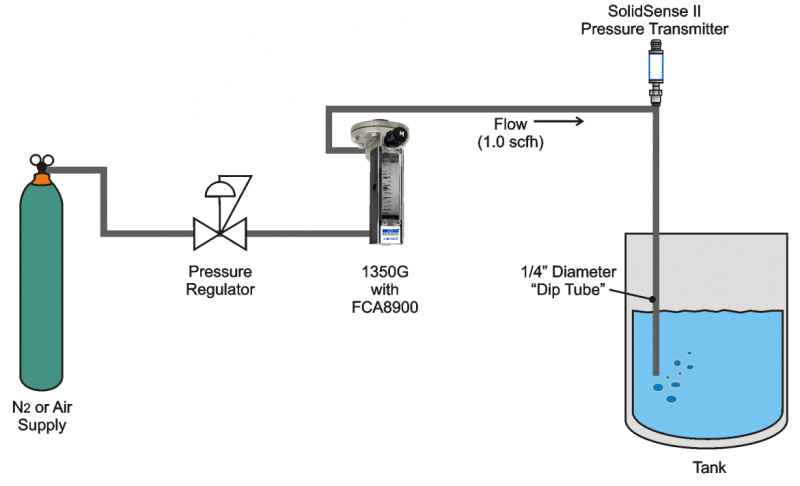 Using a Brooks Instrument Model 1350G purgemeter with a Model FCA8900 integral downstream flow controller will keep the flow rate constant in the dip tube with the varying downstream pressure caused by the varying liquid level. This further improves the level measurement by keeping the offset constant. The supply pressure to the flowmeter should be set to a value high enough to overcome the back pressure of the liquid level and the minimum pressure drop needed across the flow controller. A supply pressure of 25 psig would be adequate for tank levels up to 30 feet. The flowmeter scale should be sized (i.e. compensated) for this supply pressure. Also available from Brooks is the SolidSense II® pressure transducer for the primary electrical output. Brooks Instrument has been a supplier of choice for achieving accurate measurement of liquid level for many years, and to several industries, including petroleum refining, electrical power and semiconductor. Steve is a senior applications engineer at the global headquarters of Brooks Instrument in Hatfield, PA.